Editor’s note: William Pomeranz is the acting director of the Kennan Institute at the Wilson Center in Washington D.C. The views expressed are his own. 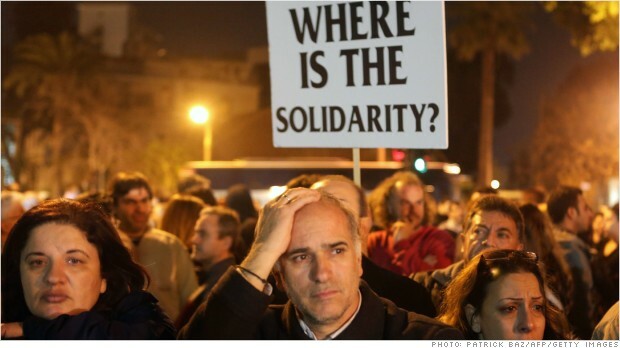 The European financial crisis has reared its ugly head – this time in Cyprus. The tiny nation’s lawmakers have rejected a confiscatory tax on bank deposits that would have allowed the nation to receive a 10 billion euro bailout from the EU. Cypriot citizens angrily took to the streets to express their disapproval of the plan, but it turns out that they were not the only aggrieved party. The Russian government also joined in the chorus of protests, calling the Cypriot government’s actions “unjust, unprofessional, and dangerous.” Much of the money to be expropriated, it turns out, is held by Russian individuals and businesses (or, to put it in slightly less flattering terms, oligarchs and shell companies). But Russia’s public outrage masked a more fundamental dispute with Cyprus concerning the island’s status as a major offshore financial center. Cyprus has been the preferred destination for Russian money for years. Close proximity to Russia – along with an assortment of tax privileges – made it a convenient location for Russian companies and oligarchs to park billions of dollars. Yet not all of this money stays in Cyprus; the country is one of the leading foreign investors in Russia, a statistical anomaly for the island, but nevertheless evidence that at least some Russian money returns to its country of origin in the form of foreign direct investment. Cyprus retained its access to the Russian market even after it joined the EU in 2004. It further shrugged off repeated criticism from other EU member states that Cyprus served as a prime location for laundering Russian assets. But the 2008 financial crisis – and the collapse of Greece – delivered a crippling blow to the Cypriot banking industry, forcing the country to seek alternative sources of financial support. Russia has provided important assistance during this crisis, most notably, a 2.5 billion euro loan in 2011. As the most recent discussions of proposed rescue plans heated up, the Russian media reported that the Russian Finance Ministry was preparing more onerous conditions for Cyprus in exchange for any additional Russian money. Most notably, Russia was demanding that Cyprus hand over information about the Russian owners of bank accounts and corporations located on the island. Such a transfer of confidential data undoubtedly would destroy Cyprus’ ability to serve as an offshore financial center, a fact that would no doubt have been greeted with cheers in Kremlin, which has conducted a major public campaign against offshore operations for the past year. The primary spokesman arguing against such structures has been Vladimir Putin, who introduced the word “deoffshorization” into the Russian during vocabulary during his December 2012 state-of-the-nation message. He bemoaned the fact that businessmen managed to flee Russian jurisdiction for their investments and other business activity through various offshore structures. Putin further mentioned the need to sign bilateral agreements with different offshore locations to promote offshore transparency. Putin’s ultimate objective appears to be that all major transactions (i.e. privatizations) take place in Russia and be governed by Russian law, thereby making it more difficult for Russian money to escape the country. So Moscow’s demand that Cyprus provide detailed information of Russian depositors can be seen as part of a determined effort by the Kremlin to go after these offshore havens and somehow return money onshore. This may be wishful thinking considering how fast money moves around the world and the existence of alternative offshore locations. But it has become a consistent refrain of the Russian government over the past months. Not surprisingly, in light of Russia’s extreme demands, the Cyprus government opted for the EU alternative, namely to subject large accounts, over 100,000 euros, with a 9.9 percent tax. Such a levy had a certain logic; Russians were the greatest beneficiary of the Cypriot banking system, therefore, they should be the ones who pay for the bulk of the bailout through the new tax. Luckily for the Russians, the Cypriot people were equally outraged by its government’s actions. This means that now Cyprus is looking for a new way out of its crisis. The situation is comparatively worse than it was just a few days ago; no depositor can rationally now believe that his or her accounts are safe in a Cypriot bank. It is also clear that the major EU countries have no intention to bailout Cyprus for the sake of Russian account holders. Meanwhile, the Russians are furious because they were reportedly not consulted before the announcement of the draconian EU bailout conditions. Russia clearly wants to protect the money of its citizens, since some of the money is destined to return home. But at the same time, Russia also wants to strike a blow against the use of such offshore havens. Cyprus is quickly running out of options, but it would appear that Russian help – no matter what guise it comes under – arrives with important strings attached, namely in order for Russia to save Cyprus, Cyprus must be willing to surrender its offshore status. Next entry »The coming water wars? they deserve to suffer these bankcrupt greek people are vermin there children must die. first of all.. some grammar wouldn't hurt. second of all.. post your personal issues somewhere else and third, for your information these two nations have suffered the unimaginable and you are not even close in understanding how much they are hated, exactly because they are small yet powerful and at this very moment and they are turning the world economy upside down, because so it happens they hold a vast amount of gas and natural resources that everyone is after. thank god for people like you, just to remind us the worthy and civilised nations as and the cultures that survived. unfortunately no greek children will die, not while people like you exist. and guess why... cause they want and they will fight you. Dude, what is your problem? Greece is a great place, and I know that their financial situation has nothing to do with the people that live there and whether their children should die or not. I know many Greek people, and they are much better people than a grammatical idiot like you, or anything you will ever live up to be. Dude, what is your problem? Greece is a great place, and I know that their financial situation has nothing to do with the people that live there and whether their children should die or not. I know many Greek people, and they are much better people than a grammatical idiot like you, or anything you will ever live up to be. And E.Ch was right... They will come for you, because when Greece and Cyprus come to ecenomical power, people like you are their first target. It is so important to think before you speak. Case in point: when I was in 5th grade, I was at the grocery store and I recognized the parents of a friend of mine while they were shopping. I didn't say hello, but I did notice that they were in front of the condom section. That next Monday, I said "Hey Tony, I saw your parents at the grocery store, they were buying condoms." He wasn't my friend after that. Cyprus, the former parts of Greek Island, better-off being alone and let it go back where it was. EU, they considered themselves as One. But, practically they all apart. What Cyprus needs to do now is to quit the Eurozone and the EU and forge a new alliance with Russia. The whole idea of joining the Eurozone was nothing but a bunch of nonsense in the first place. The West has never done anything for the Cypriots and never will at any time in the future, either! It is all so stupid that it makes you think Cyprus is part of EU or something! Oh right, it is indeed part of EU! Hi, Andrey, how important is the Syrian port of Tartus to the Russians? It's a matter of time that Assad falls and the Sunnis will throw the Russians out! What do you think of having a port in Cyprus to serve the Kremlin? Nonsense and more nonsense paid for by the oligarchs-they own the media, don't they ? The banksters are trying to rob the people in Cyprus blind. What are the people of Cyprus to do after the EU central planning from Brussels destroyed their economy ? No mention of toxic assetts in their banks , of the banksters' gambling ? All the small countries of the EU had a vision of betterment, a progress , but got robbed instead. Now they need to get out of debt slavery and Brussels central planning. The future of Cyprus is not on the present course, but a 180 degree turn to their own economy without Globalism. Globalism and E U planners destroyed Greece as well and that is about to change. Excellent post, rightospeak. Thank you. No doubt tax-evasion is thorn in every government's side. There's no love lost in Moscow on rich Russians and oligarchs, who keep an offshore account in Cyprus. The EU isn't keen on bailing Cyprus out and is turning the screw on the banks, because this island state is an El Dorado for money-launderers. Cyprus is now offering citizenship to the Russians that lost at least 3 million euros. EU should have kept both of these Greek banana republics out. They will always drag Europe down. Always. for more information about our loan services. We would like to share some business funding solutions that might interest and potentially benefit your organization. This program is currently opened to Private Limited and Limited Liability Partnership and individuals only. GET YOUR FUTURE BUSINESS CASH ADVANCEMENT TODAY!!! Sarcastic stand alone one liner comments that contribute nothing to the discussion such as: " rite guise? ", "not surprised from babykiller Assad", or "Turkey = terrorism" will be deleted without explanation. If you want to make such comments, back them up and contribute. Automobile loan, Personal loan. I am available to satisfy my clients within a maximum of 3 days following receipt of your application form.